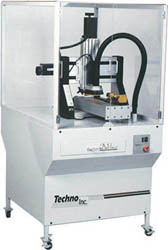 The DaVinci Series routers are small machines, aimed at small, precision machining. They come with two possible electronics packages: Stepper and Servo. These machines are generally sized to order, and may come in many different sizes. Servo DaVinci - uses servo motors and electronics. Stepper DaVinci - uses stepper motors and electronics.